Blended learning is a buzz word that’s been thrown around quite a bit lately and brings together the best of both classroom learning and elearning. In fact it seems to be the ideal solution all-around as it appeals to all learning styles, circumstances, needs and demands. It combines the support of classroom learning with the flexibility of elearning. Blended learning has been defined by Innosight Institute as “a formal education program in which a student learns at least in part through online delivery of content and instruction with some element of student control over time, place, path or pace.” Proponents of blended learning argue that by incorporating ‘asynchronous internet communication technologies’ into courses a ‘simultaneous independent and collaborative learning experience’ is facilitated, and this contributes hugely to student satisfaction and success in such courses. Blended learning however largely depends on the technical resources with which the learning experience is delivered - these tools need to be up to date, reliable, and user-friendly in order to have a meaningful impact. Such tools help students learn or review key concepts, stay organized, show what they’ve learned, submit assignments, track achievement, and communicate. Blended learning uses for example a learning management system (LMS) to teach and support learning in a classroom. With access to a LMS learners can access high-quality course materials, course calendars and assignments at any time of day. 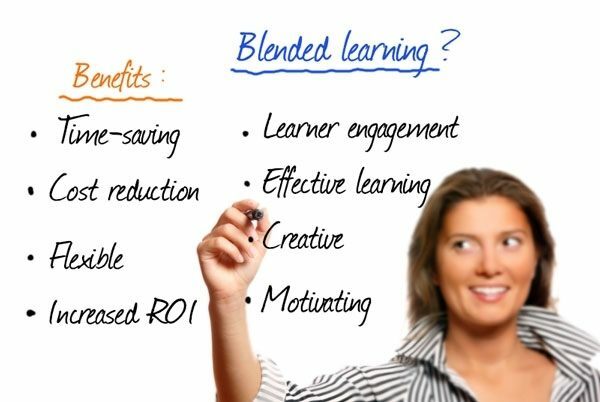 Choose and compare the eLearning Industry's LMSs with Blended Learning Support! In this great matrix via the Ontario Ministry of Education , we can see that blended learning has the most to offer students in terms of communication between teacher and students, collaboration, and demonstration of learning. Please note that they refer to “dropboxes” in the table but any file share system could be used. This great post on why blended learning works spells it all out. Basically, a blended approach ensures that not only is the learner engaged more and driving his/her individual learning experience to some degree, but also since different learners have different learning styles, a blended approach is more likely to cater to those varying needs. Of course there are also numerous benefits for the instructor – instant feedback, and the ability to quickly assess learner performance and needs based on reporting, testing or quizzing via the LMS. Resources (for ILT or instructor led training) can also be managed efficiently with a minimum of fuss. The use of technology in the corporate setting has led to an increased preference for blended learning techniques. Blended learning streamlines the training process, and gives the ability to deliver engaging training to a large number of learners, all over the world – i.e. it enables a wider reach.For learners, a blended learning approach means that they can access training resources outside scheduled face-to-face training sessions. Learners benefit from multiple learning channels and media formats – appealing to all learning styles. You might call a blended approach more learner-centric since both online and offline learning channels cater to different needs and demands. Since learners are not dependent on one source of information, if face-to-face sessions are missed learners can find that information elsewhere which encourages self-paced learning and increases knowledge retention. Learners get the benefits of the traditional classroom, along with the flexibility of elearning. Garrison, D. R., & Kanuka, H. (2004). Blended learning: Uncovering its transformative potential in higher education. The Internet and Higher Education, 7, 95–105.